National Geographic photojournalist Catherine Karnow’s unique works are well known, but not many know why she’s drawn so much to Vietnam. 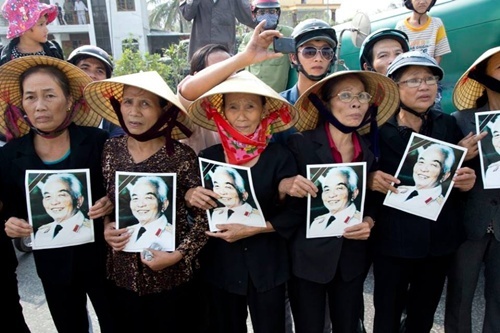 American Catherine Karnow has been a household name in Vietnam for sometime now, but what kept her returning to the country for almost three decades has not drawn much attention. "It was literally because of General Giap that I came to Vietnam for the first time. I think it was ‘duyen’," Catherine said, using the Vietnamese word for fate. She was already a professional photographer working on assignments and editorial and corporate projects when she first came to Vietnam in 1990, but it was not until she began photographing General Vo Nguyen Giap that she rose to stardom in Vietnamese eyes. She had the privilege of getting close to Giap thanks to her father, Stanley Karnow, a journalist and a Pulitzer-winning author whose book "Vietnam: A History" changed the perspective of many generations of American people about the Vietnam War. Millions over the world learnt about Vietnam in the 1960s from Stanley Karnow’s writings. He was already a celebrated journalist when he did several interviews with Giap. Catherine received Giap’s exclusive invitation to be the only non-Vietnamese photojournalist to document his historic first return to the forest encampment in the northern highlands where he devised the legendary battle of Dien Bien Phu that ended French colonization. The family of Giap continues to cherish Catherine as a talented photographer and close friend of the family. They allowed her the same exclusive position at his funeral. Until today, General Giap remains the first and only Vietnamese political figure Catherine has spent substantial time with. "As a journalist, I never actually had a formal interview with General Giap. I’ve learnt a lot about him from his family. I’m still a close friend to Giap’s grandchildren." 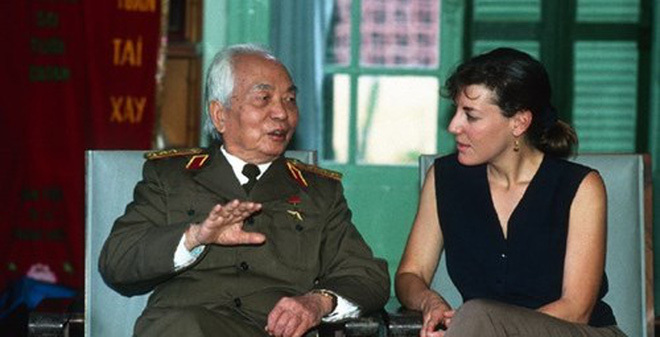 But there is something more to Catherine Karnow’s connection with Vietnam than her popular association with Vietnam’s revered war hero. Karnow’s work on Vietnam has principally focused on its people and culture, and there is something magnetic about the country that kept bringing her back. "It is the little things, everyday epiphanies and coincidental discoveries that keep me coming back to this country," she said. One such event was with her "The Woman on the Train" picture which has been published countless times around the world. Tran Thi Diep and her children, captured in a photo by Catherine Karnow on a Saigon-Hanoi train in July 1990. The photo was taken on a train from Saigon to Hanoi in July 1990. 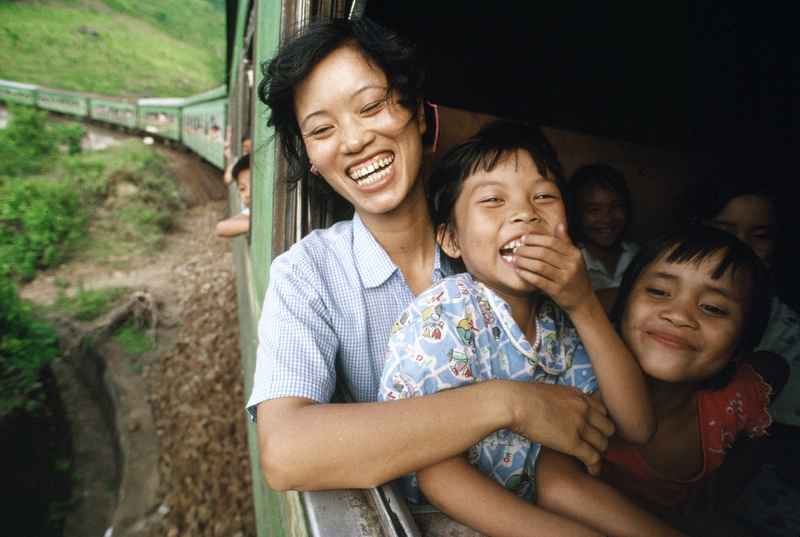 It was moving past mountains in central Vietnam and Karnow was looking to take photos of people at the window and see the rest of the curving train when she saw the young mother with her children. Catherine lost the woman’s contact and did not hear from her until Rosalyn Vu messaged her on Facebook after she recognized her mother, Tran Thi Diep, in the photo. Catherine and Diep reunited after 20 years and naturally, Catherine was invited to Rosalyn’s wedding in September. Another time, in 1995, Catherine came across a woman in Hanoi and chased after her on a motorbike to ask to take pictures of her. She was featured on the cover of the Smithsonian magazine in January 1996. Years later, she managed to find the woman’s house and gift her the photo in print as well as a copy of the magazine. "The lady was thrilled because she’d never received a photograph or a magazine before," Catherine said. A young woman that Catherine Karnow photographed on the street of Hanoi, and another photo of hers on the cover of the Smithsonian magazine. Even without her father’s trips to write his historic book about Vietnam, Karnow’s family had piled up a lot of Vietnamese memories. Before her parents got married, her mother had already lived in Vietnam. She’d spent 1953-1954 with her first husband, an American diplomat. He got sick in Saigon and passed away in a hospital in Manila, Philippines. Karnow feels the tug of destiny even in her current relationship with her boyfriend. His boys from a previous relationship are a quarter Vietnamese, since their mother is half Vietnamese and half French. Catherine Karnow’s father died the same year as General Giap, a couple of months earlier. "My father talked about Vietnam all the time with his Vietnamese journalist friends, and other friends who worked in Vietnam. "I was visiting Vietnam when I received the message that my father had passed away. 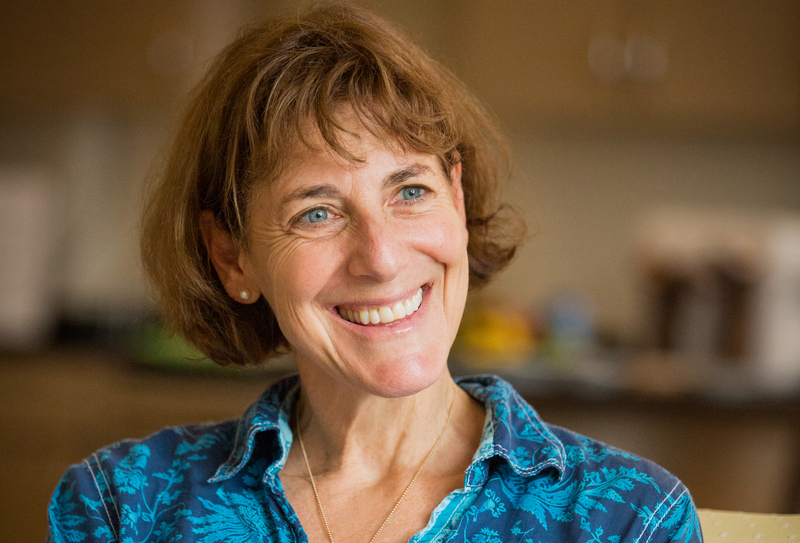 I was there in Saigon, the city he loved and introduced me to, and I realized it was all meant to be," Karnow told the audience at a presentation she gave at the U.S. Consulate in Vietnam in HCMC on October 3. "I don’t want to generalize Vietnamese people. But as time goes, the people I meet and run into here still have that marvelous sense of curiosity and interest in foreigners and warm hospitality," she told VnExpress International. Karnow’s voice acquires more than a tinge of nostalgia whenever Hong Kong is mentioned, as it is there that she was born and raised. Time-Life had asked Stanley Karnow to set up a bureau in Hong Kong. He did and worked as the bureau chief there. "I was wrenched away from Hong Kong, my motherland, when I was 10 years old, because my parents decided it was time to go back to the States. It was their home, but not really mine," Karnow said. "The loss of Hong Kong is at the core of my being," she added. The traumatic experience of losing her "motherland" affected all aspects of her life. "The Vietnamese have lived with loss for a length of history and it is that sense of loss that Vietnam and I have in common," Karnow said. "My friend Lady Borton, an academic who has lived in Vietnam for many years, taught me that the word ‘buon’ in Vietnamese (sadness) means to find beauty in sorrow and it is so affirming to me. Sadness is the expression and look on so many people I’ve photographed. I realized what this country means to me finally, is that I can find beauty in its sadness." 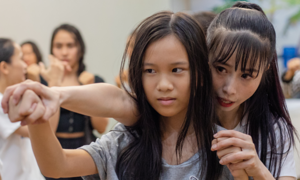 Karnow’s commitment to Vietnam and the country’s role in giving her the profile she has now would not have been possible without several Vietnamese women who have formed a support team over the years. She has nothing but unreserved praise for them. "‘Helpful’ is a very poor word to describe them," she said, referring to current and former female assistants and producers in Vietnam as smart, sensible, positive and loving. "I don’t even have the words to express how tenacious, hardworking, and committed they are. When you find Vietnamese women like them, it’s like hitting a jackpot." Ngan Do, Catherine’s current producer and assistant, said she values Catherine’s inner child, passion and can-do spirit, which makes every meeting they have seem like a casual yet insightful discussion. "Sometimes we only sleep 4-5 hours a day but it’s always so fun, full of adventure, and a rich life every day when we’re together," Ngan said. Karnow describes herself as a documentary photographer focusing on people in Vietnam; and that remains her focus in the country. The celebrated photographer said she does not use any special camera technique in Vietnam. "A lot of people don’t realize the art of photography has nothing to do with techniques. Yes, you must understand your camera and camera settings, but a piano player who knows all the keys doesn’t necessarily make a good pianist," she said. The difference in Vietnam, Karnow said, was her substantial experience in the country, which lowers people’s guard and allows the foreigner access to their life and stories. "That’s the difference between photographing Vietnam and elsewhere. People here are more open to me because of my long commitment to their country," she said. She said among the missing pieces in her long documenting of Vietnam is the topic of ethnic minorities. She would definitely be looking into that in the future. Vietnam’s urban areas have been her major interest thus far, but she wishes to venture out to other terrains. Karnow said she is going to work more on Agent Orange, taking photos that tell the stories of the affected people. She said Agent Orange was a war crime that is very important for Americans to be educated about. "The U.S. is waking up to allocating funds to remedy these tragedies and I want the movement to keep going." Karnow said she is likely to return to Vietnam next month to work on a documentary. 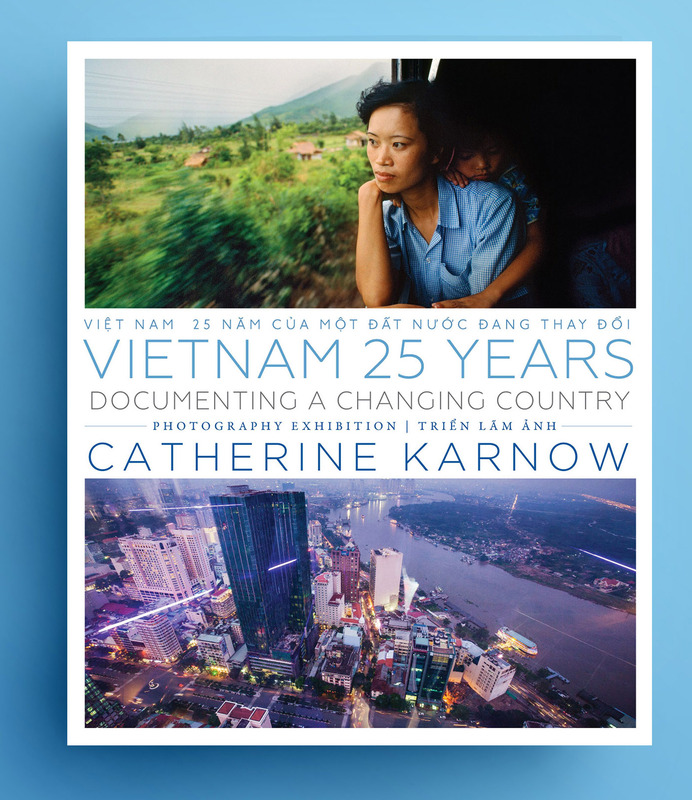 Apart from the National Geographic, National Geographic Traveler, Smithsonian, French and German GEO and other international publications, Karnow has also participated in several episodes of the Day in the Life series, the Passage to Vietnam photography book project, and Women in the Material World project, one that focused on the status of women around the world. "In terms of my career, I’m working on some teaching projects in Vietnam and in the U.S. In life, I’m trying to get my boyfriend to join me on my next trip to Vietnam," Karnow said, with a resounding laugh.